Jakarta - PT. Toyota Motor Manufacturing Indonesia (TMMIN) has managed to received the Good Factory Award organized by the Japan Management Association (JMA). The awards have been held since 2011 is awarded to firms in the Asia Pacific region which has shown increasing improvements in terms of productivity and quality. The award ceremony was held on October 19, 2016 was taking place in Tokyo, Japan, and presented directly by Masami Nakamura as Chairman of JMA to management TMMIN represented by Julyanto Nandi, Director of Production & Plant Karawang, and Bob Azam, Director of Administration. Julyanto Nandi, Director of Production and TMMIN Karawang Plant stated that the award is increasingly lead TMMIN to further improve the performance of its production management. "We are very honored to have been entrusted to receive the award in the category of Good Factory Management. It became our passion to continue to provide the best for consumers through relentless efforts to provide global quality products manufactured from quality manufacturing facilities globally, "said Nandi. The assesment for Good Factory Award is divided into three categories: Monozukuri Process Award, Monozukuri People Development Award and Monozukuri CSR Award. Companies that have good value in these three categories entitled to receive the Factory Management Award. TMMIN is the only company outside Japan who won the award in this category. The Factory Management category is a recognition that is given to companies that have a high level of management as well managed to increase productivity and quality. This award legitimize the Indonesian industry capabilities that have been assessed in line with other developed countries such as Japan and China. This Factory Management Award is expected to enhance customers trust not only in domestic but including the export market on the quality of products TMMIN. This course will support activities aimed TMMIN to continuously maintain exports in line with the commitment to contribute to efforts to boost non-commodity exports and to enhance the country's foreign exchange surplus. Earlier in the beginning of October 2016, the Ministry of Trade menganjar TMMIN with Primaniyarta Award in the category of Exporter Performance for the 7th time. TMMIN has 5 manufacturing facilities located in Sunter - Jakarta and Karawang - West Java. These facilities produce vehicles in whole or decomposed, engines, components, as well as a production tool for the pressing process (dies) and welding (jigs). The manufacturing process at TMMIN is done completely that includes: Casting, Stamping, Welding, Assembly and Quality Control. In total, 9,500 employees are involved in production activities that the result is to meet the needs of the domestic market and export. Overall, TMMIN produces 7 models of vehicles and 2 models of machines. 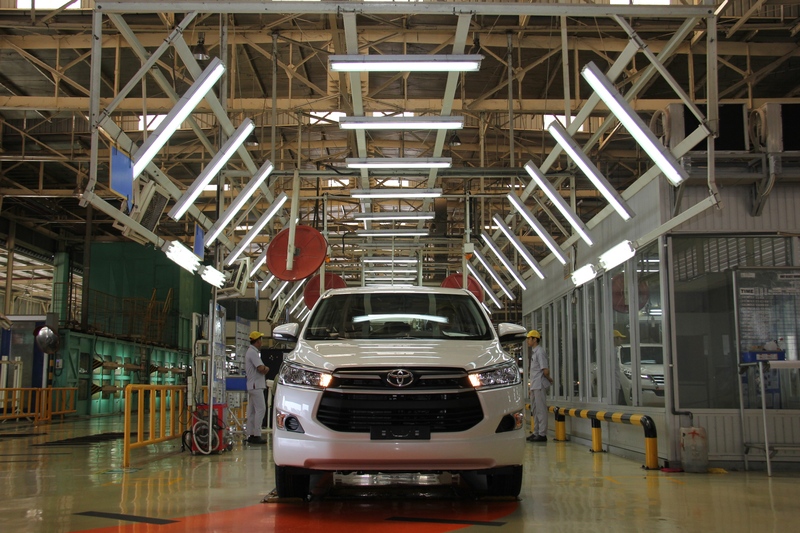 Kijang Innova, Fortuner, Etios, Vios, Limo, Yaris and Sienta produced in Karawang Plant 1 and 2. For the engine, TMMIN produce two types: NR that produced at the new plant at Karawang 3 and TR engine manufactured in factories Sunter 1 and 2. Production management in TMMIN can not be separated from the human resource capability inside. In each manufacturing facility, TMMIN also opened a training facility of Toyota Learning Centre which aims to improve the skills and knowledge of employees TMMIN of the Toyota Production System (TPS). TMMIN also opened an academy called the Toyota automotive manufacturing Indonesia Academy (TIA) where graduates will be awarded the certification of automotive manufacturing.